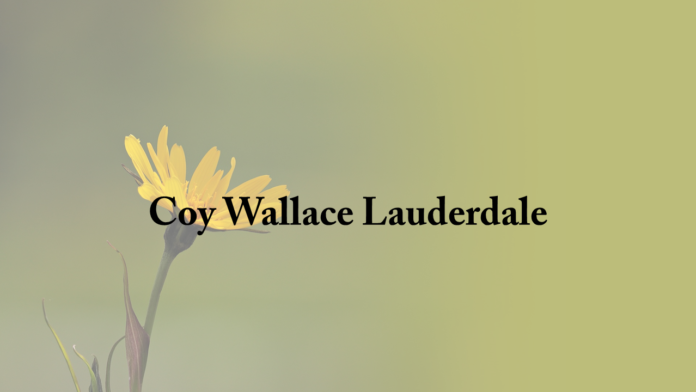 Home News Obituary: Coy Wallace Lauderdale, Jr.
Coy Wallace Lauderdale, Jr., 74, of Haleyville entered into rest on April 14, 2019. Mr. Lauderdale was born Oct. 26, 1944 to Thelma Inez and Coy Wallace Lauderdale, Sr.
Coy is survived by his wife of 56 years Ellie Marie Lewis-Lauderdale; daughter, Connie (Tom) Martello; one granddaughter, Carly Martello Waid; one great-grandson, Cameron Samuel Waid; and sisters, Delartis Brakefield and Marquetta Lauderdale. He was preceded in death by his parents Coy and Thelma Lauderdale; daughter, Samantha Amanda Lauderdale; brothers, Wayne and Randall Lauderdale; and sister, Ivorene Norris.